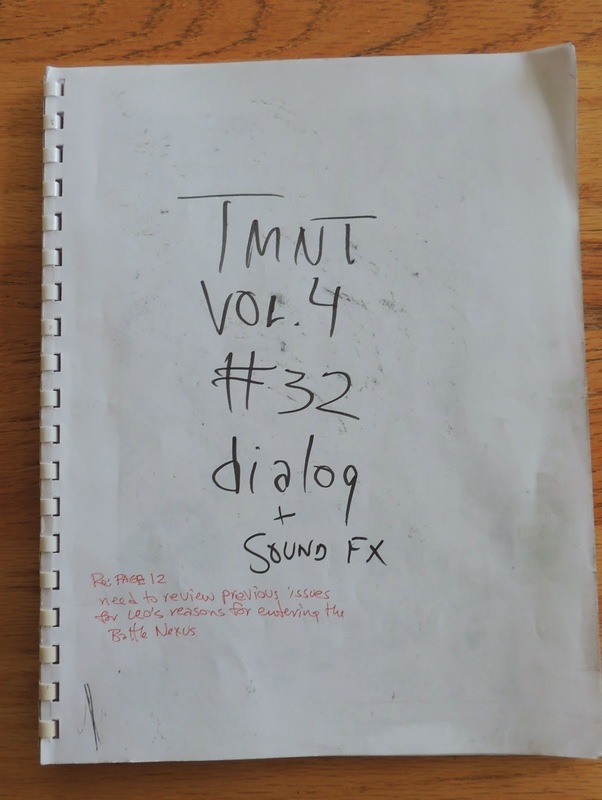 It's been a long time coming, but my plan for this thirty-second issue of TMNT Volume 4 is to try -- and I emphasize the word TRY -- to have it ready to purchase, in printed form, in time for my appearance at Steve Lavigne's "Shellback Artworks" store in Wells, Maine, on May 4. My intention is to offer it there exclusively, at least that day and probably for a little while afterwards. I thought it would be appropriate to do this, given that Steve Lavigne inked this issue, and did a really good job. I think it is possible -- I have a few more tweaks to do to the work I've already done on the lettering and sound effects, plus I have to figure out what to put in the extra inside pages and inside covers and back cover, and my pal Mike Dooney has not fully completed the wonderful painted cover he started a long time ago -- but I don't want to offer any guarantee that the book will be ready for May 4. But it almost certainly will be ready and on sale this spring, probably in both the limited edition, $10 per printed copy fashion I tried out with issue #30, as well as a freely-readable digital issue available online. In the meantime, if anyone wants to send a letter of comment for consideration for possible inclusion in this issue, I am open to that. I would prefer to not get questions about the upcoming TMNT movie or the Nickelodeon animated series or the ongoing IDW TMNT comics, as I have no involvement in any of those things, but if you must ask questions about those topics, I will deal with it. The sooner letters get to me, the better, with a real deadline being probably the first of April. Of course, I can't guarantee I will print all of them. If you want to send a letter, it would probably be easiest to just post it here as a comment. And to make sure I understand that your comment is actually intended to be in the running for inclusion as a letter in the printed comic, it would be a good idea to include "Okay to print" somewhere in the comment. In the meantime, I thought some of you might be interested in a small peek at my process of putting one of these books together, specifically in the area of writing the dialogue for the story. Sometimes -- back when we were doing this on a regular basis -- I would do this with the penciled artwork, but in this case, I had Steve's inked versions to play with. 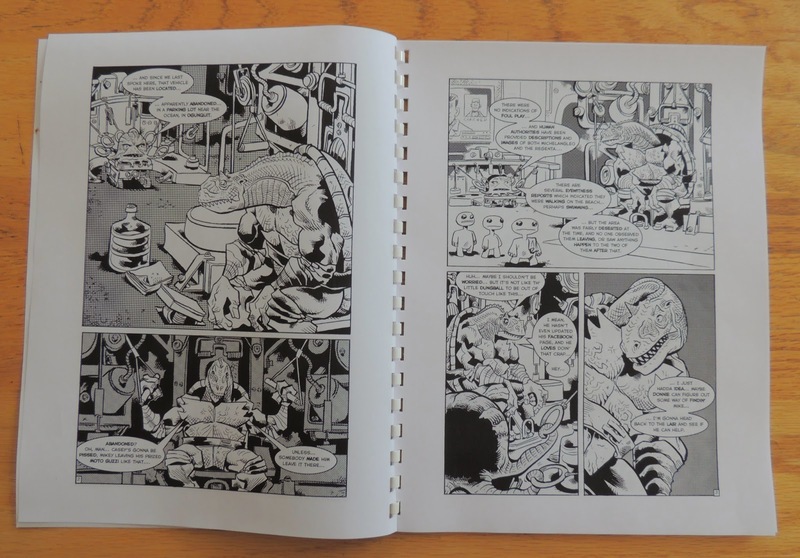 I scanned them all, and did a quick assembly of the pages in Quark XPress so that I could print out a copy of the book with all of the artwork in it, with pages back to back, but obviously with no dialogue or sound effects yet. There were also no tones at this point. Here's the cover of that "dummy" copy, on which I have scrawled some words to let me know what it is. Once I have this comb-bound dummy copy, I start referring to the plot synopsis I had originally given to Jim Lawson to remind myself of key elements which need to be in the dialogue (this text is printed on pages which I bound into this copy, in the back). Once I have gotten myself warmed up and my memory is refreshed, I get out a fine point color marker (in this one I began with a green marker, then switched halfway through to a brighter orange one) and start roughing in the dialogue. Occasionally, I will indicate where the dialogue should be located in the panels, but often is just enough to have it around the edges of the panels, and I rely on memory and context to make sure I know where to put it when I do the finished lettering in Quark. First of all, I want to thank you for your hard work and amazing impact you've made with this franchise. What you've done is very much appreciated, and I would love to meet you some day (possibly at Shellback Artworks)! Here's my question (instead of sending it in the mail). You've said that you would like to wrap up Volume 4 with six issues. Is that still something you would still like to do, and does issue 32 leave that option open for you? 1) Do you think Volume 31 will ever be made available as a printed book, there is something about holding a book that I love versus reading online. 2) Whether it be on May 4th or later, although this issue would be exclusive to Shellbacks would there be an opportunity to purchase online. I will be attending a wedding quite a distance from Maine and would feel incomplete without this printed issue. 3) Most importantly, in this 30th Anniversary year could you in a few words describe the feeling of having co-created one of these most widely recognized franchises globally? In closing - thank you for your consideration in answering these questions and contribution to the lives of so many with your passion and imagination. With the turtles turning 30 this year I have to figure there has been some reminiscing on your end. Care to comment on your top five memories/events in the past thirty years of turtlemania? P.s. I am flying all the way from Chicago to meet you and Kevin on FCBD. I will be the guy whose shoulder you are signing for his new TMNT tattoo! My letter to be printed if selected, ok to print! "Wow, Im happy you got the TURTLE-TASTIC spirit again! Thank You Mr.Laird! I know you grow tired of TMNT as needing a break but I LOVE IT WHEN YOU GET BACK IN THAT MOOD. I am truely excited! Thank you for the past 3 decades of art and story-telling! TMNT has undoubtedly been one of the leaders of independent comics over the years. You and Kevin paved the way for many anthropomorphic stories and character developments. As a child, I can remember being in awe of these turtle comics that started showing up at local comic shops and shows. The awe and it's accompanying emotions have always stayed with me. Hearing the news issue 32 will see print has amplified all these wonderful feelings again! Happy 30th anniversary to you sir, and congratulations on all the success and memories hard work has brought you all. Do you foresee anything for TMNT or Mirage Studios past the printing of issues #32? Or, would you possibly consider this to be your "last stand"? Either way, thank you for all the years of unforgettable stories and memories! As others have already wrote in, I love Volume 4 and have been waiting patiently to see its conclusion. Is it possible to have at least one new issue of Volume 4 a year? I also miss seeing Jim Lawson's art, and would love to see him again when new issues of Volume 4 come out. It's hard to believe but I've actually been following Volume 4 since 2001 when it first came out and I was only 15 back then (I'm now 28), so I've been following it for most of my life. I'd just love to see Volume 4, and potentially the Mirage universe in general, reach a satisfying conclusion. Thank you. This is certainly some excellent news, and I hope it comes to fruition. If so, then hopefully someone will pick up a copy for me at Shellback! As echoed by an earlier question, any chance of ever seeing issue #31 printed? Being a long-time fan of the Turtles, both the animated version and the original Mirage version (I'm always gonna love the Return to New York and City at War epic). I'm excited to see what will happen in this new issue, especially the whole deal between Karai and Casey. I'm also extremely eager with Mikey's vengeful mindset and leading his own army. I understand the story won't jump leaps and bounds forward since we have multiple plotlines to cover in this new installment, but we can't really complain. The Mirage TMNT live on once again and we get to see their adventures proceed a little further. I'm anxious to see this, though I also hope you go back have issue 31 printed as well. Perhaps IDW can have Volume 4 collected, including 31 and 32. Either way, I'm glad you're back in action. Welcome back Sir Laird, welcome back. This sounds really great. Unfortunately, I won't be able to make it to Shellback Artworks on May 4. I hope that there will be an opportunity to purchase this through the internet, maybe through the Mirage website? Also, if you're getting #32 printed, would it be possible to print #31 as well? I'd love to have a printed copy of that too. 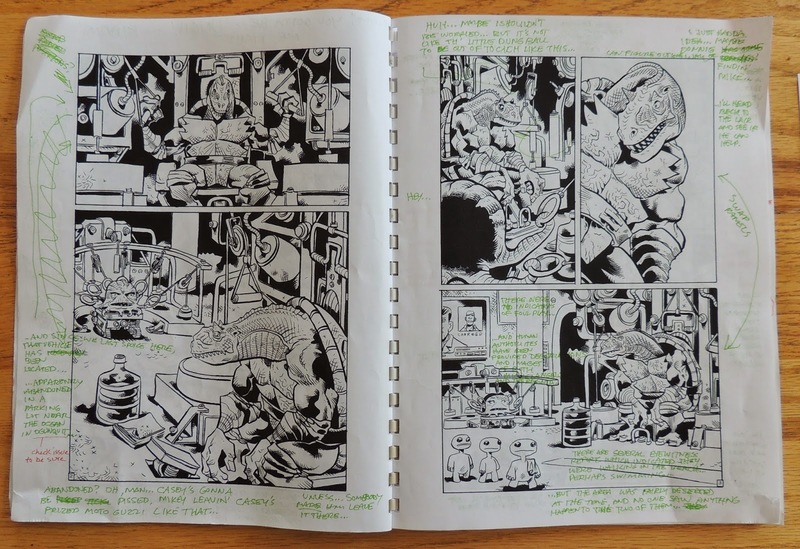 When TMNT first started back in '84, you and Kevin started out as just wanting to create comics. Within about 5 or 6 years TMNT was a complete franchise with licensing of video games, movies, toys, etc. Does it feel refreshing to work exclusively just on the comic now? I just want to thank you, Kevin and Mirage for 30 years of these beloved characters and their story. My childhood would not be as memorable if I never encountered this creation. My love for the Turtles still sticks with me today, and it is still my number one fandom. I remember meeting you at NYCC 2009 and reading Volume 4 when I was a teenager in New York. I don't consider myself to be too into comic books anymore, but the Turtles are the only characters that I actually care about to go into a comic shop and read about. No other characters can do that for me. I am very excited that you are considering finishing up this story. I am wondering what kind of closure you will give these characters in the possible issues and stories to follow? Will you return to the story over a span of time or will it be short and sweet? Either way, I am extremely glad that you are thinking about it. One last quick question: What was your favorite moment with the Turtles over these 30 years? Even though the future of this property is in different hands, I am forever grateful for what you and Kevin created. God bless. My question: 30 years after creating the turtles, with comic books, tv shows, movies, video games, toys, and multiple generations of kids and adults enjoying TMNT, how does it feel to have yourself forever established in pop-culture history? Happy Anniversary! Feel free to edit the question if needed. Even if you don't publish it, seriously this is HUGE and I'm sure you thought about this... You (and Kevin) are in a special club of individuals that include people such as Stan Lee and Matt Groening. What's awesome about you and Kevin was that it all started as a single independent comic. Not many people can claim to have done what you guys did. As a fan, I'm thankful for all your hard work. I wish you the best of luck in post-turtle life. And please make the print comic available for purchase to others who don't have the means or ability to make it to Maine, such as myself. This is the best TMNT news I've heard in a while, and there's been alot of TMNT news. My only concern is that I desperately want to get my hands on a copy of this and #31 if ever printed. I can't make it to Shellback Artworks, as a I live prohibitively far away. Please, please make it available online after the event. Vol. 4 is one of my favorite runs and seeing it go forward excites me, but the thought of missing out on a printing of an issue is as scary as it is exciting. Hey Peter btw I was going to inform you of how I print my comics... You could set it up through there if your worried about a money vs cost of printing. If your interested Id love to send you a copy for a possible review. I would really love to buy this and #31. I'm from Germany, so it's always a hard time to get rare issues like this one. Hopefully there will be a printed issue for a worldwide sale. Seeing the news of this issue going to press was fantastic. As a 36 year-old I, like many my age, first experienced TMNT via that first crazy animated series. As a kid growing up in the middle of nowhere Minnesota I had never even heard of independent comics before but devoured that show voraciously. Being the inquisitive kid I was I dug deeper into it and pretty quickly discovered the original comics upon which the show was (often loosely) based. Those were a revelation to me that got me into comics and more reading in general for the rest of my life. Now here 30 years after you first introduced the world to these bizarre and wonderful characters I have 2 kids of my own with a third on the way and my oldest son, just turning six, has a wishlist full of TMNT toys and books he'd like for his birthday. It's crazy to think about how long these guys have endured and to see these original versions of the characters still going on today. Being able to continue reading this thread or story and characters that has continued since the inception of the TMNT brings a smile to my face, and while I know all things end some time, these guys deserve to not be left unfinished, but to have a true finale on the original creator's terms. This one more step towards that is something I'll love to read and am truly thankful for. Thanks for 30 awesome years of your creation and my son now thanks you as well! Yes, it is definitely ok to print this in the issue if you see fit and if you do feel free to edit it for length if you need the space. It'd be an honor to be considered to have a letter printed in this series either in this issue or #31 if that one ever sees print. Definitely add my voice to the chant hoping for issue #31 to see print. I'm happy just to be able to read it at all to be honest, but this black and white art with all the tonal work just looks all the more beautiful physically printed on paper. Again, thanks for continuing to give to the fans. Can't wait to read it! I was delighted to hear that we will soon be getting another comic issue featuring the original (and my preferred) incarnation of the Turtles. As a big fan of Volume 4 I've been eager to find out how it concludes. The Mirage-verse Turtles story feels largely complete but the conclusion to the fourth volume is something I've hoped would appear at some point. Whilst #32 may not be an ending, it will at least provide us with a bit more of the puzzle. Like many other fans I would also like to put in a vote for a print copy of #31. I don't think any of us would mind if it didn't release alongside #32 - it could be like how #15 of Volume 1 arrived shortly after the sixteenth issue. Anyway I look forward to reading the new issue of Volume 4. All the best for any future projects (Turtles or otherwise). Greetings and Salmutations, Mr Laird! 30th Anniversary Shellebrations would be Cowabungled without your return to the TMNT; thank you for your dedication to Volume 4. My gratitude to you for your Co-Creation is like Sharpie marker ink; permanent. Playmates Toys were my introduction to the Heroes in a half shell; the action figure cardback art - ‘The Evolution of the Turtles…’ - the first ‘comic’ I read. Turtles track an obsession that, like Michaelangelo, is Wild & Crazy. Sir, as you reflect on the poignant pizza points since November 1983, where do you hope the Ninja Turtles will be in another 30 years? Thank you for being the architect of my fandom; an original Ninja Master! *‘Ok to print’…more than ok; please please please please print! A caps locked, exclamation marked THANK YOU! for your consideration – I would be infinitely grateful. If I could only ever ask you one questions I would ask what would be your epilogue for the turtles and friends. Do the brothers drift apart like it suggests in Tales or do they reconcile? Given the revelation of April’s origin what is her fate? Is there a legacy that lives on after the turtles? Maybe I'm cheating and that is really a bunch of questions all rolled into one but a hint at how it could have been and how it could have ended would give many of us much need closure. you could do this as a "kickstarter.com" and make millions...look into it. if leo, raph, don, and mike used katana, sai, bo and chucks in the "good universe" then what weapons would the anti-turtles: warhol, dali, rembrandt, and van gogh use in the evil-universe? Firstly, to join the chorus, it'd be brilliant if you were able to make #32 available to those unable to visit "Shellback Artworks". Living in Australia it's taken me a while to obtain every printed issue of Volume 4. It'd the great to have a full set -- including #31 if you ever chose to print that as well. And thanks for the insight to your process. I always enjoy seeing how people work. Firstly, thanks for giving beginning and independent artists a forum to show what they can do. I'm a big fan of artists like Tristan Jones (Australian pride), and I think it's great that Mirage gave so many people this opportunity. Also, I just wanted to say that I think TMNT Volume Four has been a fantastic example of well-crafted story-telling. It was something which didn't reduce the characters to stereotypes, kept the scene changing with every issue, and made you crave every instalment -- made even better by Jim Lawson's spectacular artwork. I even liked the way it was toned. It's been a truly enjoyable ride so far, and demonstrates the effort you have taken to hone your art. You've come a long way from 'Barbaric Fantasy', sir. For the record my "City at War" poster is still hanging on the wall. I'm 33 years old now, married to an amazing woman who let's me continue to read/buy comics. Since 1987, no matter where I've been in life I have never stopped reading TMNT. Thank you for a lifetime of awesome. P.S. Would be amazing to be printed. Wow. Not sure what other event allowed the barren wasteland of hell to become covered in sub-zero temperatures. I am curious, if you will cover what has allowed you to carry forward. Perhaps the inking the piece by Kevin rejuvenated some will to finish this issue? Either way... while I'd love to hear you go more in-depth on what spurred this (as you didn't hint it at your blog really unless I mis-read, so apologies) but at the same time, I'm just thankful you're back. While I would love to see this inspire you to finish the series the way you intended at the same time, I understand we all have our own pace, and again, i am just grateful you are giving this issue, much like you and Kevin gave us the TMNT in the first place. I merely want to add how excited I am to see this in progress, and glad to know you're in the frame of mind to be motivated to work on some TMNT stuff again. Looking forward to it! My name is Christian Bryant and I'm a writer for Newsy, an online and mobile news outlet based in Columbia, Mo. Was there ever a storyline in the TMNT history, before this latest reboot (due out May 16), that suggested the turtles were intentionally mutated by the ooze? There have been a couple of instances, I think, of people proposing to me the idea that the Turtles were not accidentally mutated, but were instead deliberately and intentionally mutated for some purpose. The one that I can specifically remember was in one story proposal back when we were trying to get a TV movie going with Hallmark, wherein the writer had the Turtles being the result of genetic experimentation in some secret laboratory. I also have a vague memory of discussing with SOMEONE, and I can't at this moment remember who (it may have been just myself! ), the idea that Splinter himself might have deliberately covered the Turtles with the ooze, instead of them just accidentally crawling around in it when the ooze canister broke open. If I am remembering correctly, this took place AFTER Splinter had been mutated, playing with the concept that as he became more sentient, Splinter saw this mutation thing as a means to an end -- perhaps a way to try to get his revenge on Oroku Saki. I wish I could remember what this idea was being considered for. Perhaps I have it written down somewhere. Gonna keep it short and sweet: What made you feel the need to produce another issue of this series that's been on hiatus for so long? And will this be the final issue? Have a good one Peter, Thank you for sharing this great news with us! If you do decide to print any part of my letter please feel free to edit it down. I've never been good at writing out my thoughts and, I tend to ramble on. Again, it is great to see you working on Vol4 again. Thanks for sharing. It is neat to get a peek at your process! I hope this means you will conclude your Volume 4 storyline. Although I felt the writing was disjointed at times, it has been a real "House of Ideas" storyline akin to the early days of TMNT Volume 1 or Lee/Kirby/Ditko Marvel. The Battle Nexus, the intelligent velociraptors, Raphael's further mutation, and the open contact with aliens are just a few aspects that have made the storyline special. That being said, I had accepted that there would never be a "real" Mirage-style TMNT comic again, outside of the Eastman-illustrated TMNT Annual that IDW published. In general, I do not care for the IDW series, mostly on style and quality grounds, but that's okay, as I will always have the rich backlog of Mirage comics. I hope that you will continue to produce comics, TMNT or otherwise. In any case, thanks for all the great comics that you and your colleagues have already given us. Congratulations on 30 years of TMNT! I was born in 1984, so I grew up right alongside turtles. Thanks for contributing so much to my childhood and giving me great stories to read as I get older. I can't wait to get my hands on the new issue. I really like the direction Volume 4 has gone and I really hope to one day see how it ends. In your story "Old Times" in Plastron Cafe, you show a much older Donatello fighting Shredder and some Foot Soldiers via a holographic program. After dispatching his foes, the program generates images of Don and his 3 brothers circa 1985, which brings Don to tears. This leads me to believe that the turtles don't get a storybook ending in their lives. Do you have a clear vision of what the future holds for each turtle? Do you have an idea for what the final days of each turtle would be like? "Old Times" was printed in 1992, so I've always been curious if you or Kevin ever had plans for the end. It was great seeing you, Steve, and Eric at Shellback Artworks during Free Comic Book Day 2013. It was a bummer that Jim was sick and had to cancel. My pregnant wife and I flew up from Tennessee to see you all at the signing. It was really heartwarming to me to see kids running in and out of the signing wearing their turtle gear with big smiles on their faces the way I used to run around after watching the cartoon as a kid. I can't tell you how nice it is to now be able to share my passion for all things TMNT with my son 30 years later. Thank you for being a driving force behind it all. While I have a special place in my heart for the original 80's cartoon, now that I've grown up and read the comics, the 2k3 version is my favorite TMNT version of the show and if I'm not mistaken, you were pretty strongly involved with the story aspect of the series. The characters saw solid growth throughout the series, the episodes that were essentially adaptations of individual Mirage books drove me to read a lot of issues all over again, and the Shredder twist was very unique and I found it quite compelling. I'm not sure what say you have in the matter (if any), but what would it take to get the 2K3 series released on DVD/Blu-Ray? Are there any plans to do so? I'd be first in line for a copy and I'd share it with my son along with all the TMNT comics. In any case, thanks for the comics, thanks for the shows, thanks for the childhood! Turtle Power! I'd like to say THANK you for and the guys for bringing out another issue#32! you cannot understand how much the vol 4 comics of tmnt mean to me. discovering that my favourite thing in the world from back in the days-the tmnt-had originally started out as a self published comic book in 1984 I found the real comics in my first ever using of a computer in 2002;)I found out about this through a news bulletin that a new tmnt movie was to go into production(the imagi one)and when I landed on the then official tmnt site ninjaturtles.com I accessed a world that stayed with me forever then.back then you were just starting vol 4 with issue I remember(the cover blew my mind).I couldn't follow the run then(pre-internet,pre-ebay,pre-paypal,pre.money really;)hahah)but soon did get all the issues one by one in the years that followed.the last one missing for me came even as an totally unexpected guft by jim lawson when he sent me my dragonfly comic book!I am still so greatful for that. your team gave us the thrills and chills that only you could got right to me. the free, independant from everyone else and set out to just deliver whatever you yourselves wanted to to see in those books -mirage team that brought great action and that terrificly weird aura in these stories. the artwork and writing was always exciting and just a very well crafted group effort that will last.last to make me go back and re-read the whole 30 , now 32 issue run over and over again. I might end up missing FCBD this year (curse the distance between Florida and New England), but since everyone seems to be heading to Jetpack comics I'll be sending a pic up for you as a thanks for the best birthday gift ever last year. I know i still have a long way to go in drawing but i think i've gotten better, especially at turtles and i still wanted to say thanks since my original thanks didn't quite work out as well. Hope everything is going great for this issue i can't wait to buy it. The excitement in the TMNT community is absolutely glowing right now. The 30th anniversary along with a reunion of the co-creators and much more. This is without a doubt what every fan wanted to see happen and you guys are making it happen. I thank you for everything you've brought to the people that make their lives that much more enjoyable. this is quite exciting. ill be there! Wow, I should keep up with this blog more! I am psyched to see Volume 4 getting more issues. Are you going to also offer issue 31 in printed form sometime? I would just like to thank you from the bottom of my heart Peter, Kevin, and the whole Mirage crew, for doing what you do. Onward to the 50th! I've been a Ninja Turtle fan since day one, so much so that I started taking Taekwondo (there wasn't a ninjutsu school to be found.) Today I am a Master Instructor with my own Taekwondo School. I know that many Turtle fans collect the newest toys and see the newest cartoons or the movies, which I truly enjoy but what I always enjoyed were the comics and the art. I still have a subscription at my local comic shop. I enjoyed the first turtles so much that it inspired me to become a martial artist. While training in Taekwondo I had the opportunity to meet new people, change my perspective and eventually find Christianity through my relationships with friends and families at the Taekwondo School. It all started with four turtles. Thanks and Happy 30th Anniversary. If you have the chance visit www.ADKTKD.com its my Taekwondo School.